I have given these ornaments many times as gifts and package tie-ons. They are easy but look so professional, no one believes they are homemade and only cost a few cents each to make. I recommend making a whole bagful at the same time to get your best value on supplies. Cover your work surface. Line up the cinnamon sticks on your work surface with the back of the stick facing up. You will be painting the back of the ornament first. (You will not be applying any paint on the bottom half of the front or back of the stick, so you can hold it easily as needed.) Paint the upper one third of the stick with red paint. After that dries, starting at the top of each of the sticks, paint a ½ inch band of snow effect paint for the fluff at the top of Santa’s hat. Apply snow effect paint on the bottom edge of the red paint creating a 1-inch band that will be the back of Santa’s hat and hair. 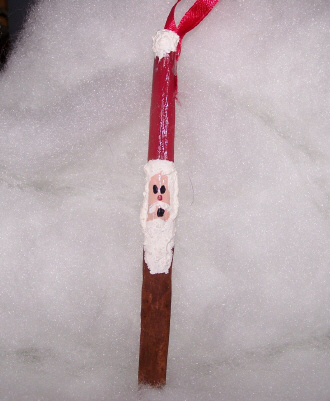 When finished with the backside, from the top you will now have a ½ -inch band of white, about a 2-inch band of red, a 1-inch band of white and about 2 and ½ inches of unpainted cinnamon stick. Once the back is dry, you can turn over the cinnamon stick and work on the front. You can now hold the stick at the bottom as you paint. Continue the band of red around to the front and let that dry. Using your flesh colored paint, paint a rectangle at the bottom edge of the red band about ¾ inch long and ½ inch wide for the face. Once it is dry, paint a 1/4 inch line of snow effect white over where the red and flesh color meet. Continue the snow effect white around the edge of the face and complete the band from the back. To create Santa’s beard, the front white paint will not be the same as the band started on the back but will instead be extended about an inch longer than the band, curving to create the look of his beard. Once dry, use your toothpicks to dot on black eyes, a pink dot of a nose (touch red and flesh paint onto toothpick for pink), a white upside down v of a mustache that meets his sideburns, and larger than a dot for an oval “open” mouth. I have included a lot of details so that even a person who is inexperienced in painting can follow the directions and be successful. The last step is to hot glue both ends of the ribbon overlapping each other at the top back of the ornament, creating a loop for hanging.